Wowza: Version 2.0 is already in alpha and is currently being tweaked for distribution. Thanks to all who have supported the themes from this site by keeping the credits link intact. Download link to be posted once i am satisfied with the themeâ€™s build. Geez guys, you get a FREE Theme and you don’t even link back? Tsk Tsk. Yes, i’m talking about you: http://clandiscomfort.net/, http://www.karmasutures.com/, zootsuitriot.com, http://www.blackcitadel.eu/wordpress/, and you, neilhoo.com. Talk about being cheap bastards…. You can modify the theme to your heart’s content as that was my intention of trying to make the theme as simple as possible for editing. But puhlease, a simple link back to this site is much appreciated. Anyway, Thanks to http://www.adwarfpaladin.com/, http://www.manthey-net.de/7thSea/, wowland.org for keeping the credits intact. Re: New World of Warcraft Theme by the time Burning Crusade hits, Hopefully i can release a new one around BC’s launch windows as i wont be able to meet BC’s street date of Jan 16 2007. Its been what? 2 months? 3 months?, since the release of my World of Warcraft WordPress called Wowza and im happy that a lot of people downloaded and are using the theme. To those who removed the theme author credits, ive got one word for ya: losers. Thanks guys. More power to your sites! 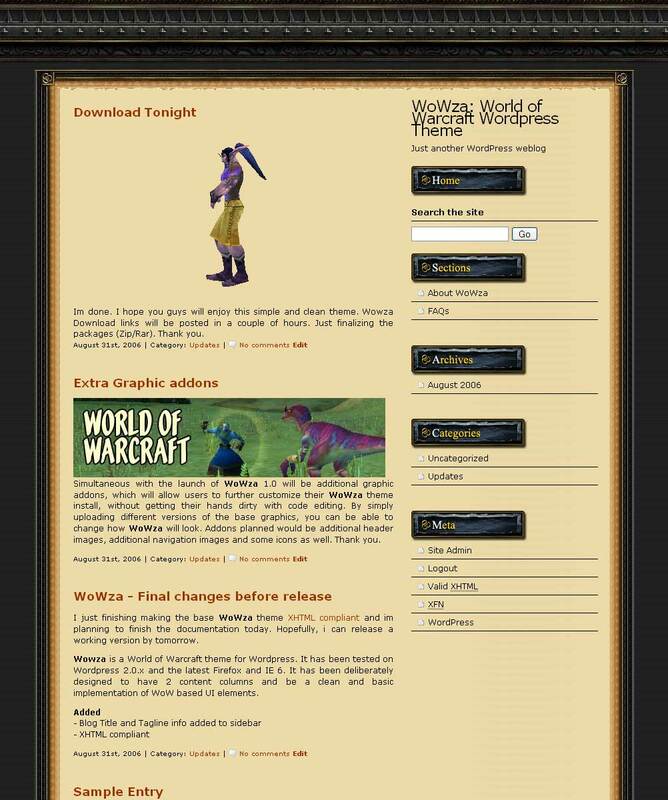 WoWza is also available on Themes.Wordpress.net 1000+ Wowza Theme Downloads and counting. WoWza is also available from http://wordpress-themes.org. Thanks for keeping the Wowza credits link, guys. Download information after the jump. Thanks to Bos Jayvee for the Digg. If you like the theme, kindly support it by submitting the post to Digg. Thanks for the fantastic theme! Thanks alot for making the theme available to the public! I forgot to ask in my previous comment. Is there any chance you can make the buttons (in the sidebar) available in .psd so that we can add our own text on them? Thanks again! kevin,your themes is so pretty,thanks for add a link for me,and how could i get your customized version of WoWza? Kiven says: Thank you. Currently, i have no plans of releasing WoWza extended to the public. Maybe in a couple of months time after Burning Crusade hits. More power to your site. What a pity.Anyway,i like your design,if is the time i can use your customized version,please let me know!Thanks a lot. Just wanted to say thanks for the theme. I’ve widget-enabled it and customised it for our guild (and to tie in the forums graphically), but the base design is yours – so thanks! Kiven says: More power to your site Shane. 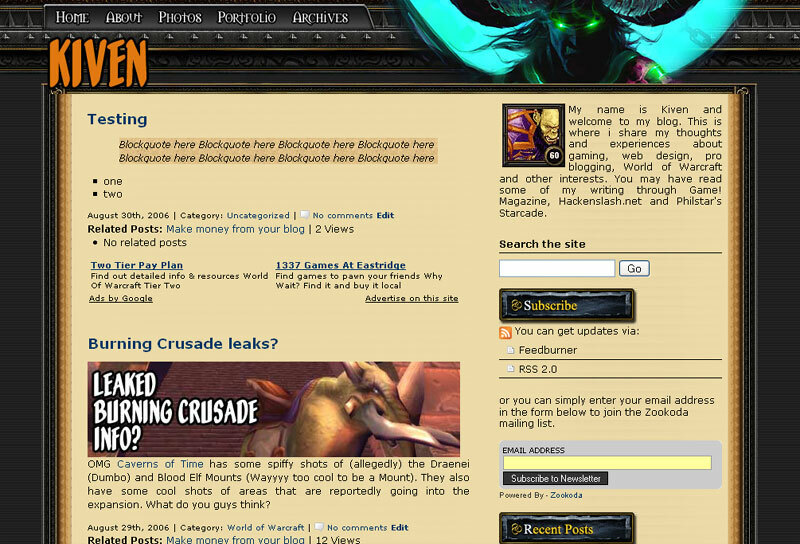 i hope to release the next version of the World of Warcraft Wowza WordPress theme by the time Burning Crusade hits. thank you. So, are you still planning on releasing the next version by the time the expanion hits? Inquiring fans want to know. How do you get a banner image in the top? I must be a nub! I’m looking forward to the new theme release. We’re going to launch a new site and would love to use your theme. We’ve started to look in to modifying the 1.01 theme. If a new, even better, 2.0 theme is coming out, we’d love to use it. And don’t worry, we’ll keep the link in there — or if you want we could probably even pay a small licensing fee to you. Kiven says: Thank you. It is support like this that keeps free wordpress theme makers alive in spite of freeloaders. Kiven….wow I got called out! Honestly, when I was reworking all the code I totally forgot to give the proper props….my bad, hope you’ll accept my lame appology and take me off the hate list!….your now properly noted for your work. Firstly, thanks for the great theme Kiven. Kiven says: Sorry to hear about your guild Shane, but those looking for a widget supporting World of Warcraft theme should definitely check out Shane’s creation. NP bro.I’m glad to know that the theme was of some use to you. id visit your site but you didn’t include your url hehehe. Thank you sir for sharing your theme ;) I am using it and I’m also giving credit to you for the theme. Great job! NP! glad to have helped. Its been a while since the launch of the BC and I was wondering if you had a date for the release of the updated wowza bc edition. also I wanted to ask you, a couple of questions about how adding a title to like the modified site you showed had. No, sorry no date this time. i have been terribly busy with work and haven’t had the time to edit the new theme, its somewhere on my hdd but it is still in the rough stages. as for the questions, kindly post away and ill answer to the best of my knowledge. Thanks! Could you please provide a link to download the sidebars buttons in .psd format ? up till now the site is on its early stages..
2. Be able to place a graphic for the guildname on top or something like the screenshot shows with wth the name Kiven. Could you send me that header file so I can tweak it a little? I promise not to copy your design id just really like something like it. Could you email me that or tell me where I could download that? 2. simply edit the header.jpg again since its a straightforward and clean design. you can also tweak the background image to better match your new header image as well. Hi there Kiven… very nice template you got here. I’m thinking to using it for my new WP blog but was wondering if you have it in 3-columns? unfortunately, i havent released the 3 column theme that im using right now. altough watch out in the next few weeks as ill have more time to release new themes very very soon. thank you for visiting. I need some help with the title images and header, can I count on you? There some way to contact you? MSN? ICQ? E-mail? Kindly use the contact image button to the right side of your screen. Thanks for the template. Nice work, easy to mod. I googled and happen to run into this website. been using a blogspot for my WoW site…but guess I want to move onto wordpress which is what I’m using for my business blog and this is a really nice theme I’m considering when I get round to it. Cheers for the theme! Great theme. Love the way it looks. Thank you very much,great theme,will use it.